Cybotactic Effect on Nitrogen and Phosphorus Hyperfine Coupling Constants in β-Phosphorylated Nitroxides. a Aix Marseille Univ, CNRS, ICR, UMR 7273, case 551, Avenue Escadrille Normandie-Niemen, 13397 Marseille Cedex 20 France. b N. N. Vorozhtsov Novosibirsk Institute of Organic Chemistry SB RAS, Pr. Lavrentjeva 9, 630090 Novosibirsk, Russia. Solvent effect is investigated on β-phophorylated nitroxides carrying electron widthdrawing groups exhibiting various steric hindrances. Solvent effect on nitrohen and phosphorus hyperfine coupling constants highlights the entanglement of polar and steric effects on the changes in hyperfine coupling constants. Nitroxide 3d• was prepared as already reported[[i]] and the corresponding nitrogen and phosphorous hyperfine coupling constant (hcc) an and aP, respectively, were measured as previously described. [6-11] Due to the presence of both N- and P-atoms at the positions □ and □ to the odd electron with nuclear spin IN = 1 and IP = ½, respectively, EPR signal of 2•, 3a-d• displays 6 lines (doublet of triplet) with a large doublet due to aP and a small triplet due to aN (Table 1). Hcc at position  is directly related to the spin population localized on the nucleus,[[i]] and to the shape of the SOMO (Fermi contact term QN, eq. 1). For □-radicals, the SOMO is of the p type and thus any increase in the s character leads to an increase in the spin population and, hence, to an increase in aN. 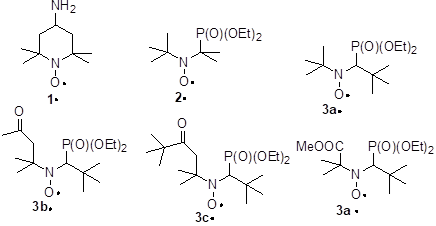 For nitroxides, a decrease in aN is observed for both a decrease in QN – because form A is favoured over zwiterionic form B[[ii],[iii],[iv]] (Figure 2) due to the presence of electron widthdrawing groups (EWG) – and a change in the hybridization (pyramidalization) at the nitrogen atom, varying from sp3 to sp2 (Figure 3), i.e., the higher the pyramidalization (form C), the higher the s character of the SOMO, and conversely. The dramatic increase in polarity – electrical Hammet constant □L are -0.06, 0.27, 0.28, 0.48, 0.48, and 0.61 – of the substitutents in the nitroxides 1•, 2•, 3a-d• do not account for the decrease in aN as expected (see y-intercept in Figure 4) by disfavouring mesomeric form B over form A (Figure 2). Indeed, aN decrease from 1• to 3a• as expected but does not change significantly for 3a-d•. This means that the effect of strong EWG attached to the nitroxyl moiety is balanced by a stronger pyramidalization at the N-atom in 3d• than in 3b,c• and 3a• (Figure 3). Taking into account the large difference in □L, the very similar slope for the plot aN vs ETN[[v],[vi]] for 1• and 2• denotes a better accessibility of the nitroxyl moiety in 2• as in 1• as more polar the nitroxide is, less sensitive aN (slope in Figure 4) is to the effect of solvent. Taking into account the similar values of □L for 3a• and for 2•, the smaller slope for 3a• denotes a larger steric hindrance than in 2• and then a lesser accessibility to the nitroxyl moiety. The smaller slopes for 3b-d• than for 3a• is ascribed to the higher polarity in 3b-d• than in 3a• and, hence, a lower sensitivity to the solvent effect. The smaller slope for 3d• is ascribed to both higher polarity and likely higher steric hindrance around the nitroxyl moiety. The Heller-Mconnel relationship (Scheme 1 and eq. (2))[[i]] shows that aP depends on the square of the cosine of the dihedral angle □. The Heller-McConnel relationship (2) shows – provided that there are no or only minor changes in the hybridization or in the mode of solvation – an increase in aP as the spin population □N□ increases when aN increases. The smaller y-intercept for 2• than for 3a-d• (Figure 5) is ascribed to a larger angle □ meaning that the conformation are very different between 2• and 3a-d•. The very similar y-intercepts for 3a-d• and its decreasing trends form 3a• to 3d• agrees with very close conformation and an increase in polarity decreasing the spin density □N□ on the N-atom. The very similar and negative slopes for 3a-d• denote same conformational changes which are much less important than in 2• (Figure 5). Hence, the bond rotations N—CP are strongly restricted in 3a-d•. The smaller changes in slope for 3a-d• are not discussed are they are due to entangled polar and steric effects. In recent articles,[6-11] we showed that the impact of conformational changes on aP is probed using the dihedral angle □ between the C—P bond and the SOMO□* on the N-atom of the nitroxyl moiety, as given in eq. (2). The value of □N□B1 is solvent dependent and is known in non polar solvents for nitroxides carrying a diethoxyphosphonyl group, and commonly accepted as □N□B1 = 59 G in n-hexane or other similar non polar solvents. As □N□ is proportional to aN, the ratio aP,n-hexane/aP,n (eq. 3) affords the value of □ for each solvent and, hence, an insight into the solvent dependence of the conformation. 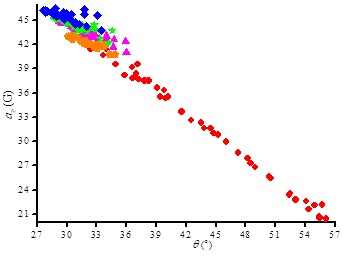 All nitroxides display (Figure 6) a decrease of aP with increasing □ meaning that all nitroxides experience the same solvent effect except at different extents as highlighted by □□ = 24° for 2• and □□ = 6° for 3a-d•. Although steric hindrance and polarity are very different in 3a-d•, the relative mobility is the same but much lower than for 2•. Moreover, the quasi-linear and decreasing distribution of aP vs □ denote that the conformational changes are overmatch the changes in polarity of the nitroxyl moiety and that these changes are quasi-monotonic with the solvent. As already observed and discussed for 2• and 3a-c•, changes in aN and aP with solvent polarity in 3d• are governed by the interaction N+•—O¯••••P+—O¯ between nitroxyl and phosphoryl moieties. Plots ETN vs aN ETN vs aP show that the changes in polarity and bulkiness of the substituents in 3d• compared to 3a-c• are baleanced by changes in hybridization at the N-atom and in conformations. The authors thank Aix-Marseille University and CNRS for financial support. ANR was granted for funding this project (ANR-14-CE16-0023-01) managed by the French National Research Agency (ANR). SRAM thanks the Russian Science Foundation (grant 15-13-20020) for supporting the correlation analysis of this work. The authors thank RENARD network for the EPR platform. Scheme 1. Conformation change by rotation around the C—N bond from a non polar solvent to a polar solvent. Dotted line for the dipole-dipole interaction +•N—O¯••••+P—O¯. Figure 5. 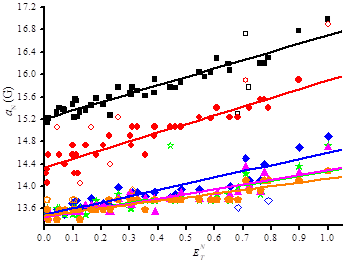 Correlations ETN vs aP for 2• (), 3a• (), 3b•(), 3c• (▲), and 3d• (). Empty symbols are for outliers. Figure 6. 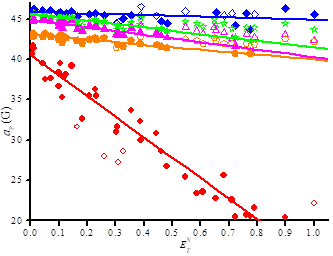 Plot  vs aP for 2• (), 3a• (), 3b•(), 3c• (▲), and 3d• (). Empty symbols are for outliers. Likhtenshtein, G.; Yamauchi, J.; Nakatsuji, S.; Smirnov, A. I.; Tamura, R., Nitroxides: Applications in Chemistry, Biomedicine, and Materials Science, Wiley-VCH, 2008, and references therein. Audran, G.; Bosco, L.; Br?mond, P.; Butscher, T.; Marque, S. R. A. Org. Biomol. Chem. 2016, 14, 1228-1292. Stable Radicals: Fundamentals and Applied Aspects of Odd-Electron Compounds; Hicks, R., Ed., Wiley, Hoboken, 2010, 173?229, and references therein. Audran, G.; Bosco, L.; Br?mond, P.; Butscher, T.; Franconi, J.-M.; Kabitaev, K.; Marque, S. R. A.; Mellet, P.; Parzy, E.; Santelli, M.; Thiaudi?re, E.; Viel, S. RSC Advances 2016, 6, 5653-5670. Audran, G.; Bosco, L.; Br?mond, P.; Butscher, T.; Marque S. R. A. Appl. Magnet. Reson. 2015, 45, 12, 1333-1342. Bosco, L.; Butscher, T.; Marque, S. R. A. Appl. Magn. Reson. 2017, 48, 4, 379-406. Nkolo, P.; Audran, G.; Br?mond, P.; Bikanga, R.; Marque, S. R. A.; Roubaud, V. Tetrahedron 2017, 73, 3188-3201. Gerson, F.; Huber, W. Electron Spin Resonance Spectroscopy of Organic Radicals; Wiley-VCH, Weinheim, 2003. Karoui, H.; Le Moigne, F.; Ouari, O.; Tordo, P. Stable Radicals: Fundamentals and Applied Aspects of Odd-Electron Compounds, Hicks, R., Ed., John Wiley & Sons, 2010, pp. 173?229. Knauer, B. R.; Napier, J. J. J. Am. Chem. Soc. 1976, 98, 4395 ? 4400. Janzen, E. G. ; Coulter, G. A.; Oehler, U. M.; Bergsma, J. P. Can. J. Chem. 1982, 60, 2725?2733. Reichardt, C.; Welton, T. Solvent and Solvent Effect in Organic Chemistry, 4th ed., Wiley-VCH, Weinheim, 2011. Efficiency Measurement of Complex Syntheses in Chemistry and Life Sciences.